I was grateful that emergency crews were there to try to pump the water out, but pretty shocked that cars were still driving through that mess (and with great speed, no less). 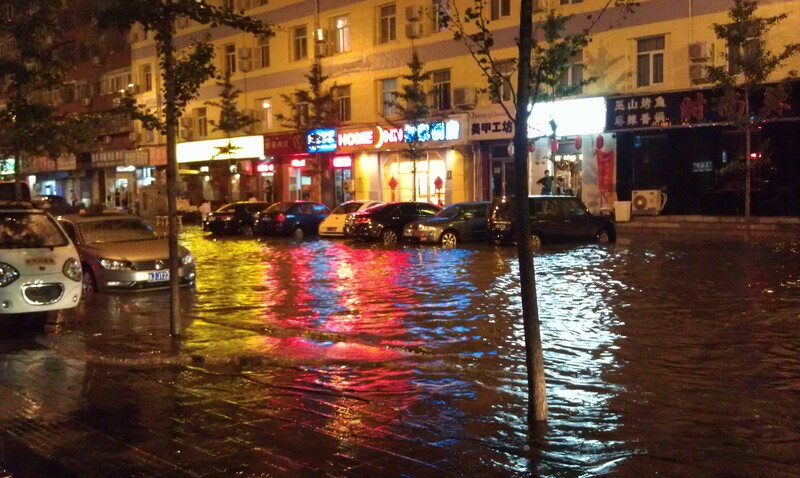 Forecasters started spouting doom and gloom this week around Thursday, insisting that Beijing was in for some epic rainfall. Having seen this preview, I was naturally concerned for what would happen to my neighborhood. Cut to Saturday morning, when upon waking up I threw open my curtains and was met with some of the worst pollution I’ve seen in months. Because those gross particles are rather heavy, I knew it was only a matter of time before the sky opened up. I got pretty soaked in a brief lunchtime downpour, which led me to stock up on food and retreat to my apartment to wait for the main event. Starting around 3pm, my neighborhood was absolutely slammed with sheets of rain, howling wind, thunder and lightning. I went into my kitchen to cook dinner around 7:30, and decided to take a peek out the window to see how the street was faring. Answer: not very well. The photo at left (very poor quality, with apologies) is of a car floating by. Floating. Needless to say, I was dying to get down to ground level and document the mayhem. The only problem was that it was still torrentially raining outside and there was no way I was getting any decent footage without damaging my camera, or worse, myself. So, I waited. I finished cooking dinner. I had a cup of tea. I obsessively checked the window every ten minutes to see if it had let up enough for me to go outside. Finally, around 11pm, the rain slowed to a moderate drizzle and I decided to make my move. Armed with a very large umbrella I trudged my way through puddles to the main gate of my compound, where emergency crews were frantically trying to pump at least 3 feet of water out of the street. Meanwhile, cars were still trying (and some failing) to drive through the river for reasons that I can’t even begin to fathom. While I was down on the street snapping away, I figured I would take some video as well. This first one gives you a pretty good idea of what it was like both for those driving and those pushing cars. I felt particularly bad for the guys pushing because they kept getting hit with waves as cars went past. I moved a little further down the street, away from the worst of it, hoping to get a slightly better photographic angle from the stoop of a nearby business. 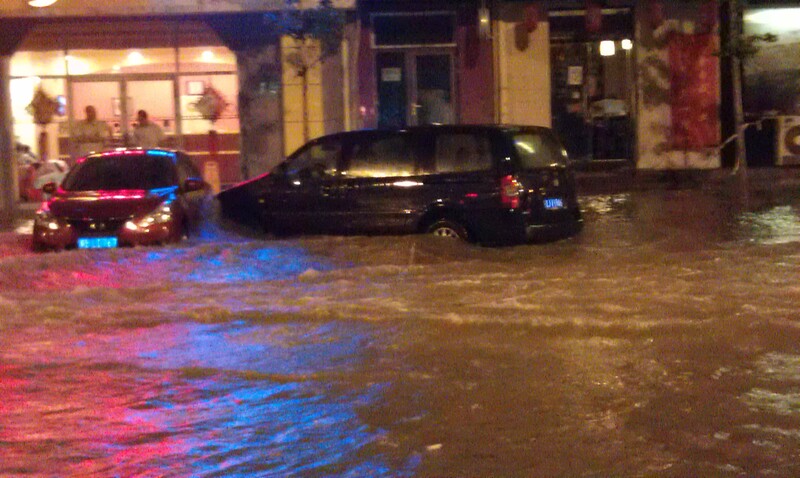 I took a few more pictures, mostly of people trying to wade their way home, and figured that was probably it for the evening. But just when I was getting ready to head back in, a viral video miracle took place: A cop car got stuck in the river. My only regret is that I didn’t manage to capture on video the moment when the cop tried to shovel water out of the wheel well. 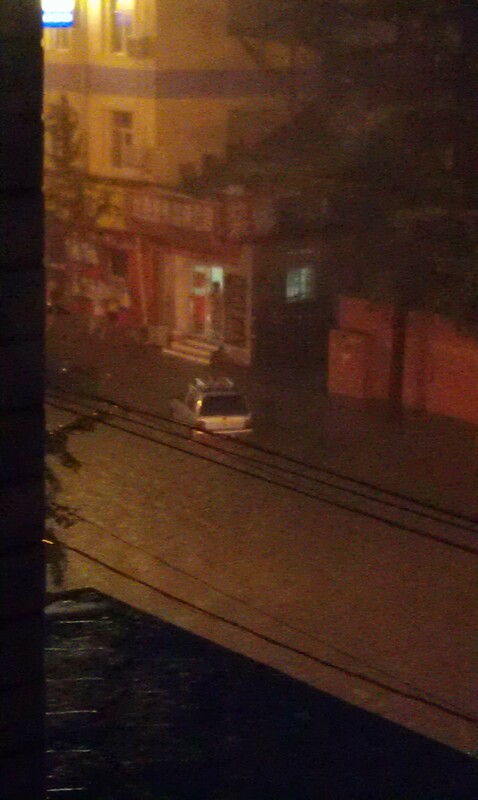 While the car sat in 3 feet of water. 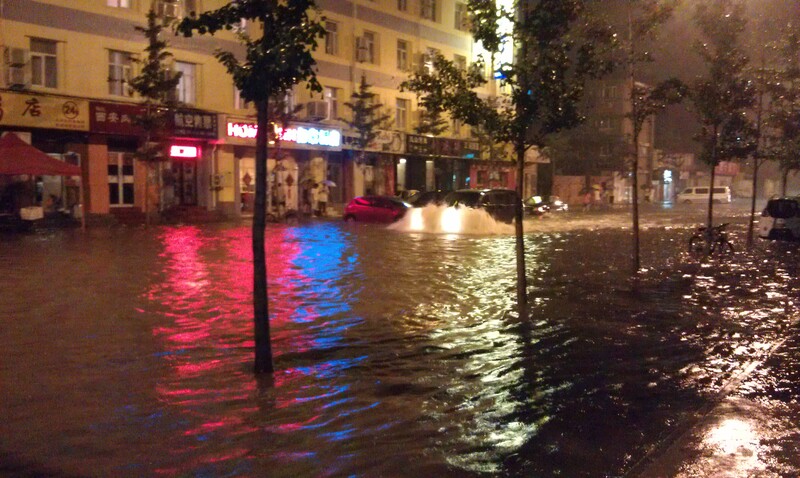 For more pictures of the damage elsewhere in the city, head over to Beijing Cream, where he’s rounded up a fairly representative collection. 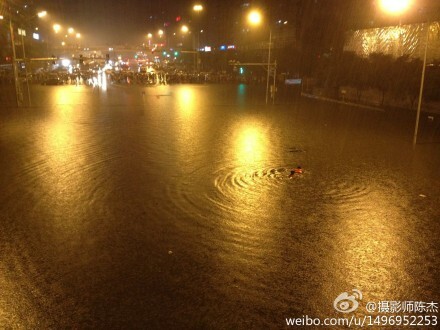 The photo below (taken from Weibo) was right next to my office building, where a man drowned in his car after suddenly being engulfed in 12 feet of water. Scary stuff.